Just Upgraded to Snow Leopard! * Be sure to customize your installation to have Rosetta support, as it’s not installed by default anymore. * If you’re an X-Code user, you’ll probably want to upgrade that separately as well (included in the optional installs directory on the Snow Leopard disc). Positive Observations: Finder is definitely snappier, so are Preview, Safari, iTunes, and iChat. The new darker default display gamma is a big improvement, looks very nice. It’s worth mentioning that several of my friends and colleagues have installed Snow Leopard on their machines (upgrades and fresh installs) with no issues. Installed Snow Leopard on 3 Intel Macs (one Core Duo and two Core 2 Duos) without a single hitch. All my apps appears to work. I launched each one and applied any updates that were presented. My 2006 MacBook has the 32bit EFI and I don’t notice any speed improvements. 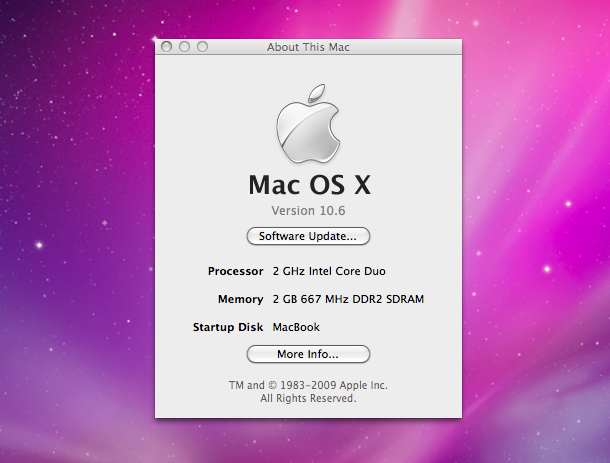 My wifes 2009 MacBook and the kids 2009 iMac are both Core 2 Duo and they are indeed snappier. Happy to see so much action on OS X Daily ! My SL went smooth, recovered 20GB of space. Had to run Safari in 32bit mode to use Airfoil and 1Password. I really like the Expose enhancements. We installed Snow Leopard on a MBP and MB yesterday without problems. I am a little peeved that there is no more easily accessible Dock resources folder, and now my dock is back to ugly (I had the background completely transparent before). Anyone know how to change the background so I can make it invisible again? Installed without issues yesterday on a MacBookPro3,1. All my preferences (dock,wallpaper,finder,etc) were saved. Finder is much quicker and I dig the airport network strength visual. I haven’t had any problems with wireless connectivity. I apologize if this is a bit late in coming. It sounds like your previously, under Leopard, replaced the scurve-*.png files in /System/Library/CoreServices/Dock to change the appearance of the Dock. In SL, you just need to go a bit deeper to make the change. Go to /System/Library/CoreServices/Dock.app/Contents/Resources. The .png files here govern the Dock. I haven’t yet determined which one governs the dots under dock icons (I hate only having one dot and prefer three for clarity). Please note that I am just hacking my way through. I haven’t seen anyone else yet provide this instruction. Modify /System at your own risk. I apologize to have to print a retraction/update. Even under Leopard the files were in /System/Library/CoreServices/Dock.app/Contents/Resources. I had backup files I forgot about in the parent directory. To better address your issue, fiddle with these .png files in Photoshop/GIMP/etc until you have what you like. Once you replace the files, don’t forget to give it a ‘killall Dock’ and don’t forget to save backups. I hope this helps. In snow leopard, I have to drag and copy from the finder to the desktop holding the option key. In leopard I used to be able to do this without having to hold the option key. I’m totally unfamiliar with altering commands, but have been told that it is possible to do so using terminal. Is there anyone out there willing to tell me how to go about doing this.